The fourth piece in my Gesture series, a series of works that use imagery of my own hands. I start with a basic concept, one that by definition is concise and easily understood. However, these concepts often are viewed differently by each of us, as our experiences and point of view greatly affect our interpretation and personal meaning of these ideas. From this simple concept, I use the images of hands to build upon the idea and make it my own. Eternity represents the struggles of inherent nature of man. For all time and all eternity, there will be some people who try to help others, while there will also always be others who take advantage of the people that need their help. There are also some that may appear altruistic, but in actuality are masking their true intentions. Despite laws and despite religion, this duality exists as a basic component of human nature, and this struggle between the selfless and selfish will persist throughout time. 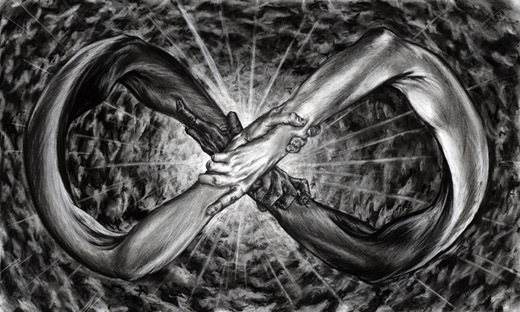 These opposites also can’t exist without one another, so they are bound together, wrapped into the infinity symbol.